I have loved cooking with sourdough ever since I lived in Alaska in the early 60s. The problem is that the starter keeps growing, just like Topsy! I give it away, I use it as often as possible, but I still end up with more than I can use. I’m open for any sourdough recipes you may have, so please send them to me! This recipe starts out with 1/2 cup of starter, and since I had extra without having to prepare it the night before, this was a good recipe to use today. NOTE: I used real sugar in this first mixture because I believe it is necessary to help the starter to “work.” Cover and let this mixture stand for 2 hours in a warm spot. I put mine in a sunny kitchen window. When well mixed, add 1 tablespoon molasses (I used blackstrap). Then add one egg and continue to mix thoroughly. Into this, mix the starter mixture. 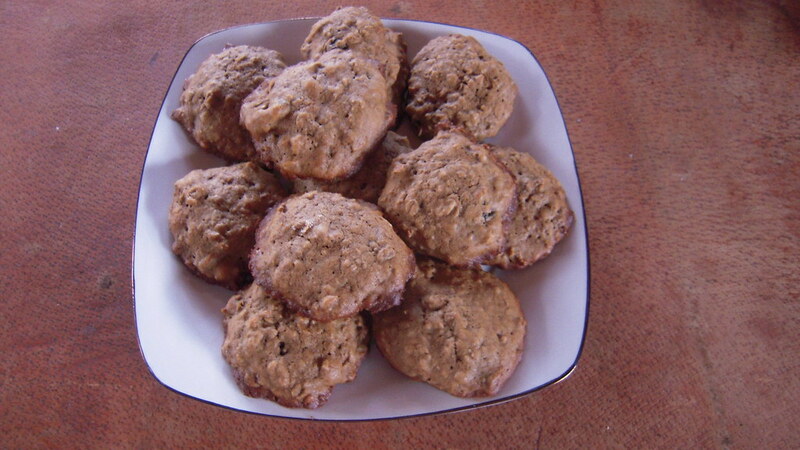 The batter will not be as stiff as most of us are accustomed to when we make plain oatmeal cookies. Using a teaspoon, drop the batter onto greased baking sheet about two inches apart. Bake at 375 degrees F. for 12 minutes. Depending on your oven, it may take a couple minutes longer, but mine came out at 12 minutes. I got 4 dozen in this batch. I love anything made with sourdough. When I lived in Alaska, I was given a starter that dated back to the 1800s (at least that’s what I was told, but Alaska is known for yarns as big as the state). At any rate, it had been going a long time, and was deliciously sour. I have made sourdough chocolate cake, sourdough fruitcake, sourdough pancakes and waffles, sourdough breads – any recipe I can get my hands on. 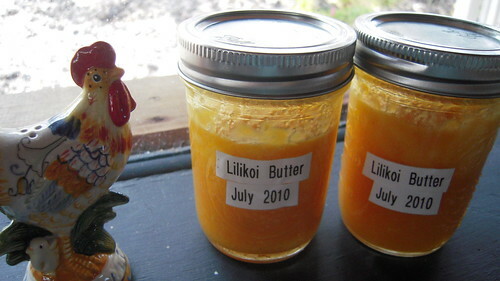 The sourdough starter or madre that I use now also came from Alaska, this time from my friend and colleague, Betsy, who used to live there, too. 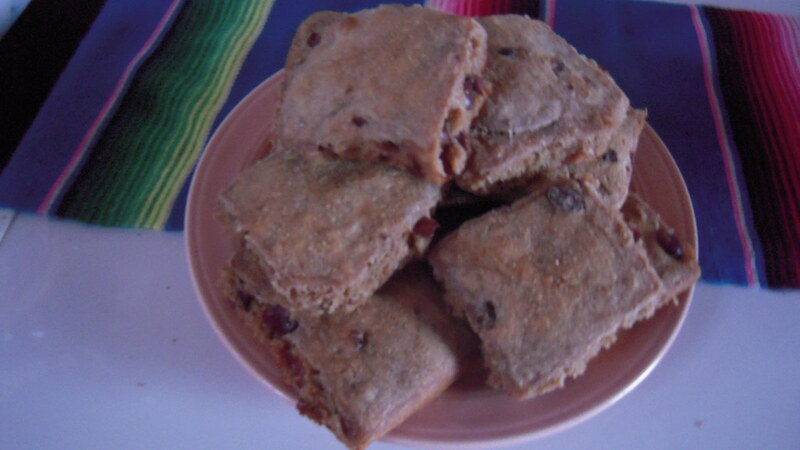 This recipe was adapted from The Tassahara Bread Book and I used dried cranberries instead of raisins. Their original recipe calls for fermenting the raisins, so I wasn’t sure if it would work to ferment the dried cranberries. I imagine you could use dried blueberries, as well. The Tassahara bakers seem to keep a sourdough raisin roll starter on hand at all times, and this might add to the flavor each time it is used. I probably won’t make this recipe as often as they do, so I didn’t keep anything out for the next time, other than replenishing the regular madre as usual. Whole wheat flour as needed for kneading. Mix the salt and cinnamon with the flour. Put the sourdough starter on top of the flour and stir in the water from the cranberries, a little at a time to form a soft dough. When the mixture is too thick to stir, work with your hands and knead for several minutes. Add the fermented cranberries, and knead a bit more. Add the dry cranberries, and knead them in, too. Keep the dough on the moist side as much as possible, but add more flour as needed to keep it from being too sticky to work with. Let the dough sit for 20 minutes or so. Divide the dough into twelve pieces for large scones. Shape into balls and place on an oiled baking sheet. Cover with a damp towel and let them sit overnight, at least 15 hours or more. 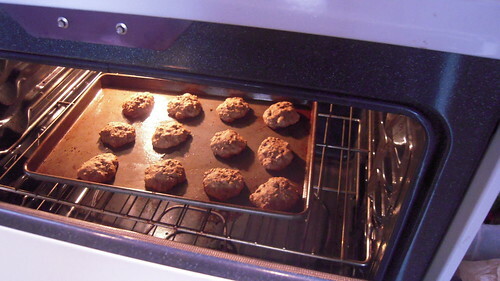 Bake at 375 degrees F for 20-25 minutes until well browned. * Fermenting the Dried Cranberries: Place 1/2 cup of dried cranberries in 2 cups of water. Cover and let sit for 3-4 days, unrefrigerated. Stir daily. Don’t change the water because it will be used in the recipe. 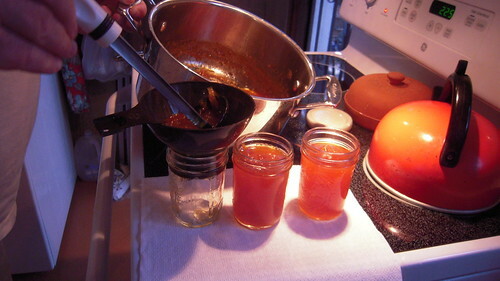 1) This may seem like a long drawn-out process, but it’s like making the pink grapefruit marmalade. It only takes a few minutes each day, rather than taking up a whole day of preparation. 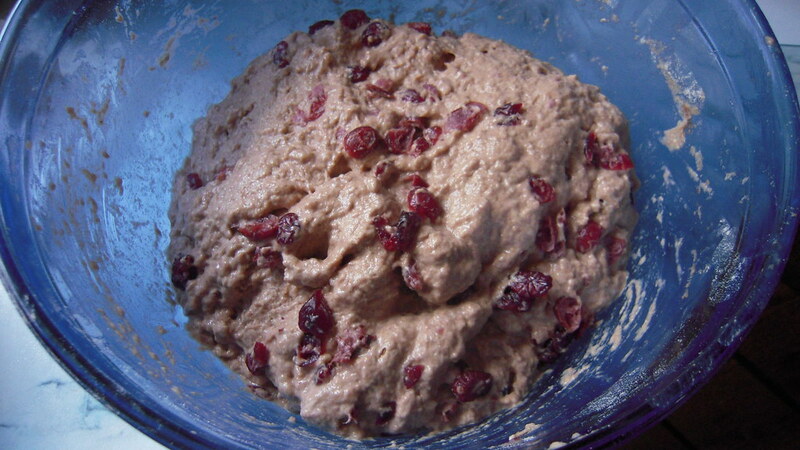 I tried this recipe for Sourdough Cranberry Rolls with great trepidation, but it was so easy! I’d like to try another dried fruit. I mentioned blueberries above, but wonder about chopping up something like dried mango or ginger. Oh my! 2) The damp towel part didn’t work well for me. It seemed to weigh down the rolls too much, so I took it off and it worked better. I think my tea towel was too thick, not thin like the old flour sack towels my grandmother used. 3) I got twenty large rolls/scones instead of twelve. Also, their recipe calls them “rolls,” but I think they are more like scones, so that’s what I call them. Whatever you want to call them, they were delicious! 4) After they were cool, I wrapped each one in waxed paper and froze them. They are warm and ready to eat after about 20-25 seconds in the microwave. Slather with butter and enjoy! A funny story about pizza comes from my high school years in Belleville, Illinois, just across from St. Louis and the Mississippi River. There was a new Italian family in the neighborhood who had opened up a new “pizza parlor,” which is what they were called then. I was with my parents and some of their friends one evening when we went in to see what all the excitement was about. I don’t think I’ll ever forget the look on everyone’s face when it was brought out. Without a doubt, that huge pizza was enough to serve everyone around the table. I suppose there are people who don’t like pizza, but I have no idea what planet they come from. It’s basically like an Italian open-faced sandwich, and you can put anything you want on it, or leave anything out you don’t want. I’ve made bread a lot in the past, but never pizza. I couldn’t imagine myself trying to learn how to toss a huge circle of dough above my head without a major disaster. Then I found a little hidden-away article in a magazine. I don’t even remember which magazine it was in. All I know is that I clipped it for further evaluation. Was I ever surprised when I read it! And it’s super delicious! 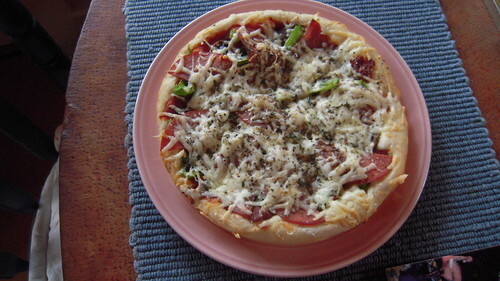 I think I could even categorize it as an “artisan pizza,” whatever that’s supposed to mean. I’m eating it right now as I type up this post! Add the yeast to the water and let it sit for 10 minutes. It will begin to look slightly foamy. Meanwhile, mix the flour, salt and sugar together in another bowl. Then add the yeast mixture to the dry ingredients. Stir until it’s well-mixed. 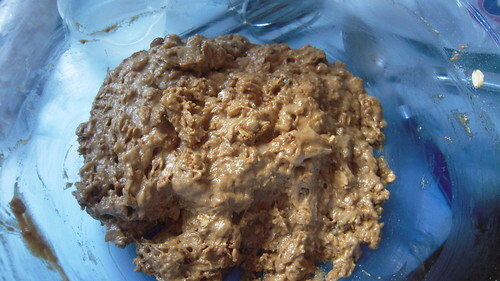 The dough should be thick, requiring a little effort to mix it. Cover the bowl with a clean kithen towel and let rise at warm- or room-termperature for about two hours. After the dough has risen, place it on a floured board to knead until smoother and no longer sticky. I pushed the dough into a greased 9-inch iron skillet with my fingers, making sure the edges came up a little on the side of the skillet to form a rim. Add the toppings, starting with the tomato paste, and ending with the shredded cheese. 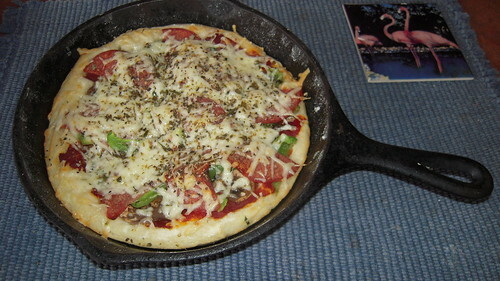 Bake at 425 degrees F. for about 15-20 minutes, or until the cheese bubbles up and the crust just starts to brown. You can put whatever you love on pizza, or whatever you have on hand. Have fun with it! This was super simple and easy – with no fancy tossing! The only wait was for the dough to rise, but I can usually find lots of other things to do around here. If this is your recipe, please let me know and I’ll give you full credit, along with my deepest gratitude for having put it where I could find it! This is a three-day process, but the flavors are absorbed so much better than a marmalade made too quickly. 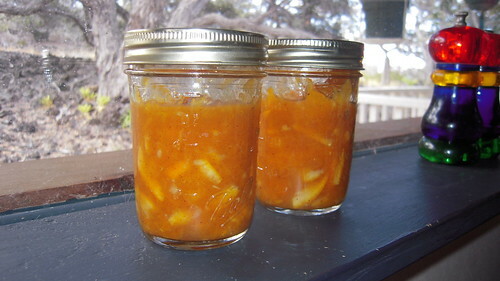 I tend to like my marmalades to have a slight bitterness, more like a true Scottish marmalade. This recipe ensures I’ll get that. Choose 3 smallish pink grapefruit (or 4 larger ones) and 2 lemons. Have 2 oranges on hand. These are not added to the marmalade, but you’ll use their juice later on. On the first day, cut off thin slabs of grapefruit and lemon rind and cut into tiny slivers. Take care not to include pith at this point. Add 2 cups water for each cup of fruit. Let it stand. 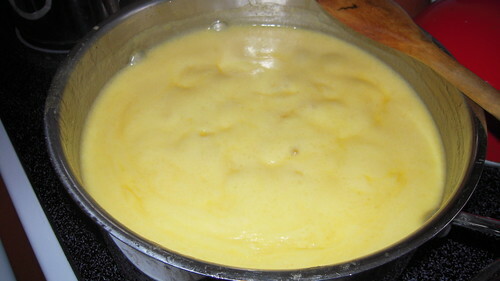 On the second day, boil this mixture for 30 minutes. 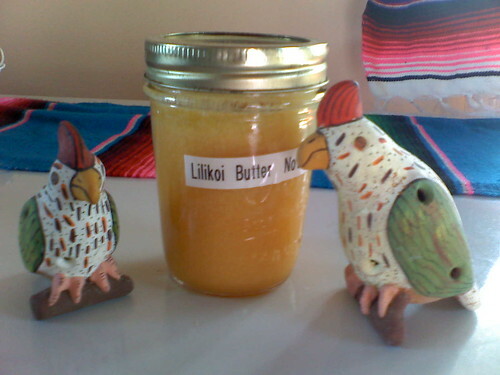 It helps the gelling process if you add large hunks of grapefruit pith to the soaking mixture. Also, cut out the grapefruit segments and add these to the mixture. On the third day, remove all the pith sections and any stray pips (seeds). Add juice of 2 oranges to supplement the liquid. This helps you to know it won’t burn dry. Also add 1 pat of butter to keep down any froth that forms. Cook using 3 cups of the fruit and liquid mixture to 1 1/2 cup sugar. Simmer about 2 hours (or less). Keep an eye on it and watch for gel to start forming. Pour into hot sterilized jars and seal with sterilized rings and lids. Turn upside down until you hear the “pop” of the lid. This lets you know you have a good seal. Perfect on hot buttered biscuits! 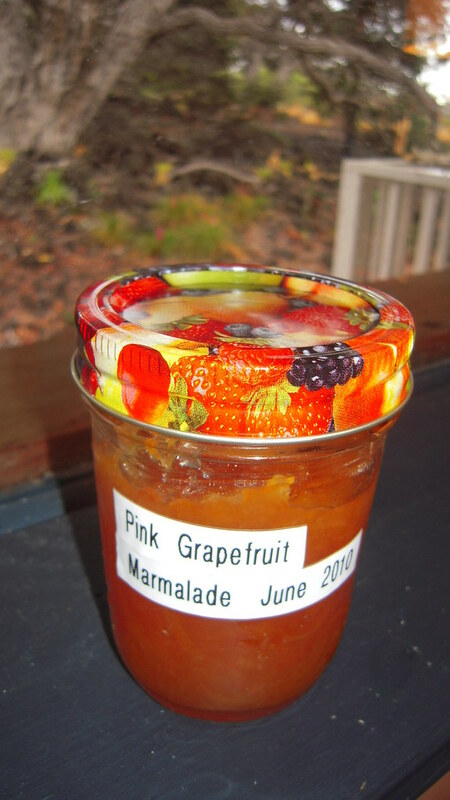 Have you ever wondered about the precise difference between jelly, jam, preserves and marmalade? I checked with Google. •	Marmalade uses the zest and pulp, and the juice, however not the whole fruit. I honestly don’t know which one this is, but because I used slivers of orange peel, and because it looks like marmalade, that’s what I call it. 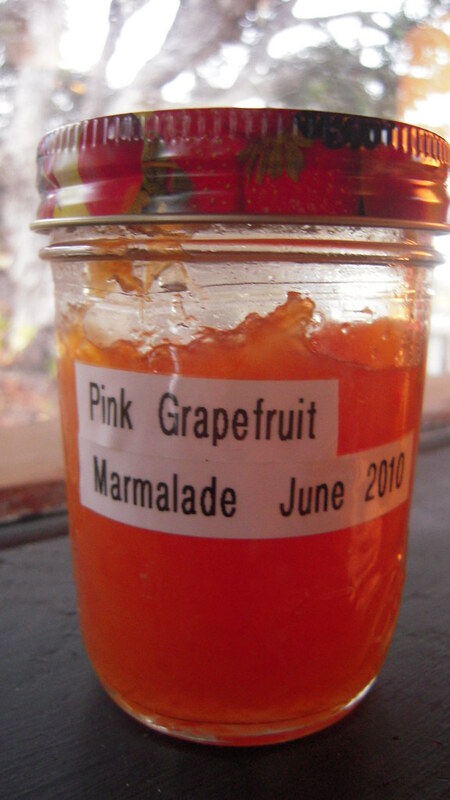 Actually, it’s more a combination of preserves and a marmalade, which probably makes it a spread, according to Wiki. It’s definitely not jelly, but whatever you want to call it, it’s delicious! Cut the oranges to remove the segments (try not to get any of the membrane). Thinly slice the orange peel (like what you normally see in orange marmalade). Combine everything in a large pot. Bring to a boil over medium heat. 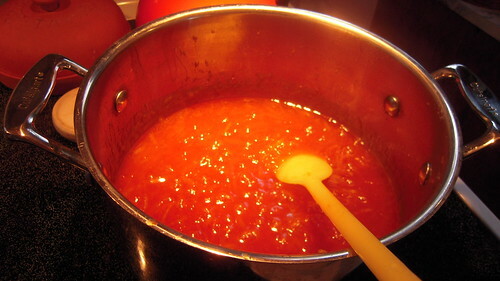 Maintain a slow rolling boil for 15 minutes while mashing up the apricots against the side and stirring constantly. Add your lime juice (lemon would work, too) and stir in. Put into sterilized jars, then cover with sterilized lids and rings. Turn upside down until you hear them pop, which means you have a good seal. I got a little more than six 6-ounce jars out of this batch. If I’d filled them a bit more, it would have been an even six jars. I love this sort of thing over ice cream, with homemade biscuits, or on a thick slice of toasted hearty whole wheat bread (homemade if possible)!